This is a very early preview of some code I'v been toying with for some time now. 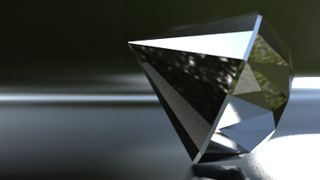 It's based on statistical variance and outliers detection, and so far seems to provide a nice speedup when rendering monte-carlo like effect, such as glossy reflections (reflection blur, in Lightwave's lingo). To be honest, the sampler used in Lightwave is really good. Sometimes it may seem less clean than other renderers but it's really a different approach. Kudos to whoever developed the current sampler. This is the heatmap generated by the shader, showing where samples are spent. Red means that the maximum number of samples is being spent, blue of course is the minimum number of samples. The Heatmap can be previewed in real time with Lightwave's VPR, to fine tune the amount of samples needed. What's happening here is that samples are lent and borrowed between pixels. Areas where not that many outliers are detected are allowed to lend samples to areas that need more rays to be rendered cleanly. An outlier is a sample very different than the other samples taken for the same pixel. Just in case: this code is not production ready, and the plugins are not available yet! As you can see, the adaptive sampler missed some outliers at the left side of the image, near the "horizon", and there's still significant noise in that region of the image. There are also some other limitations with this approach, currently samples are wasted during antialiasing. How and if this code will evolve, depends on a lot of variables. This is just a quick preview, with more details to come in august. I wonder if it is somehow possible to test your reflection blurring plugin on a project ? I'm currently in production with a 5d ridefilm and i'am having trouble with the rendertimes due to many many blurry reflections in LW.